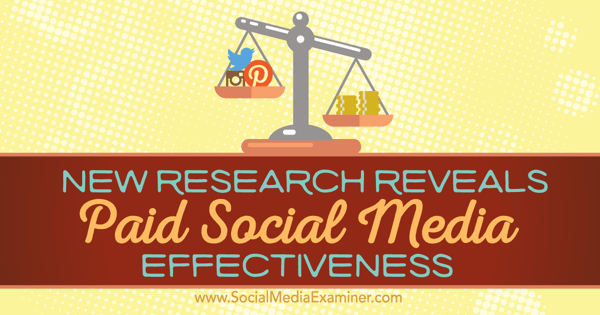 Discover insights revealed by new research on the effectiveness of paid social media marketing. In fall 2015, the Content Marketing Institute (with MarketingProfs) surveyed 3,714 marketers from around the world about content and other digital marketing successes. While just 263 identified as B2C marketers and business owners, their insights are still instructive. 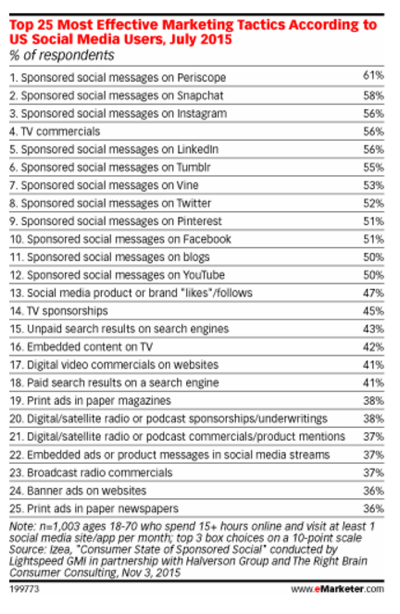 As revealed in the chart below (from eMarketer), 76% of B2C respondents use promoted posts (for example, boosted Facebook posts and promoted tweets and pins). Sixty-one percent of these users found promoted posts effective, rating them either 4 or 5 on a 5-point effectiveness scale (3 is neutral). The majority of B2C marketers rate promoted social posts and ads second only to search engine marketing (SEO and SEM) for all marketing tactics. As for LinkedIn, Facebook, Twitter, and other ads (as opposed to the more editorial-style posts), 59% of respondents rate these 4 or 5 on the 5-point effectiveness scale (74% of those surveyed report using them). 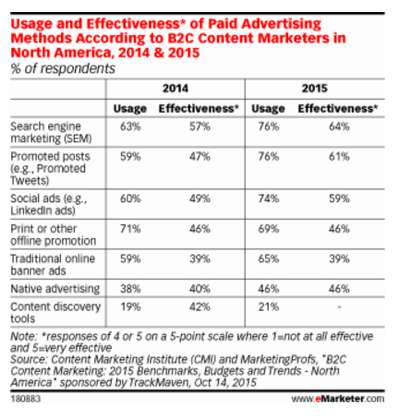 More interesting is the jump in marketers’ perception of effectiveness from Q4 2014 to Q4 2015. Perceived effectiveness stayed mostly even for offline promotion, online banner ads, and native advertising. Conversely, the number of marketers viewing social ads and promoted posts as effective leapt by 20% and 30% respectively for each tactic. Still, given the small sample size, smart marketers must explore the experience of B2B marketers and others when considering paid social ads. 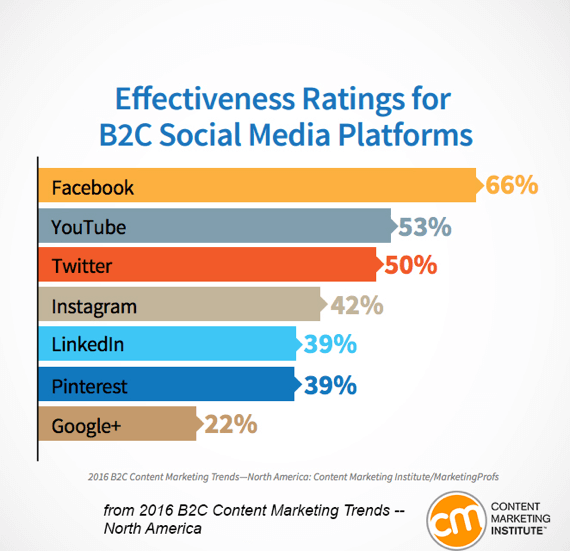 B2C marketers surveyed by the CMI also put Facebook at the top of the heap in terms of effectiveness, with YouTube coming in second. B2C marketers and businesses report they most effectively reach their audiences via Facebook. Key Takeaway: That only 263 of the CMI’s 3,714 survey respondents identified as B2C suggests that B2C lags behind B2B in adopting the more sophisticated social marketing tactics of promoted posts and social ads. These early adopters find them effective (worth 4 or 5 on the scale) at rates of 64% and 59%. A satisfaction rate 10% to 15% higher than what B2B companies report (see below) could reflect that the B2C space for these two marketing tactics is not as saturated. B2C is getting better results because with less competition, each campaign draws more eyeballs. The CMI data came from one survey, but it divided the numbers into two reports. With the majority of its respondents in the B2B space (1,521), the Content Marketing Institute had a robust sample from which to draw insights for this vertical. Of the 93% of B2B marketers and business owners using paid social media, 52% use promoted posts and 51% use sponsored ads. Forty-eight percent of promoted post users and 45% of sponsored ad users rate these tactics 4 or 5 on the 5-point effectiveness scale (again, 3 is neutral). To compare tactics, B2B marketers pinpoint search engine marketing tactics like PPC or paid search advertising as the most effective paid marketing tactics, with 55% rating them 4 or 5. At the other end of the scale, traditional online banner ads disappoint with only 29% of respondents finding them somewhat or very effective. 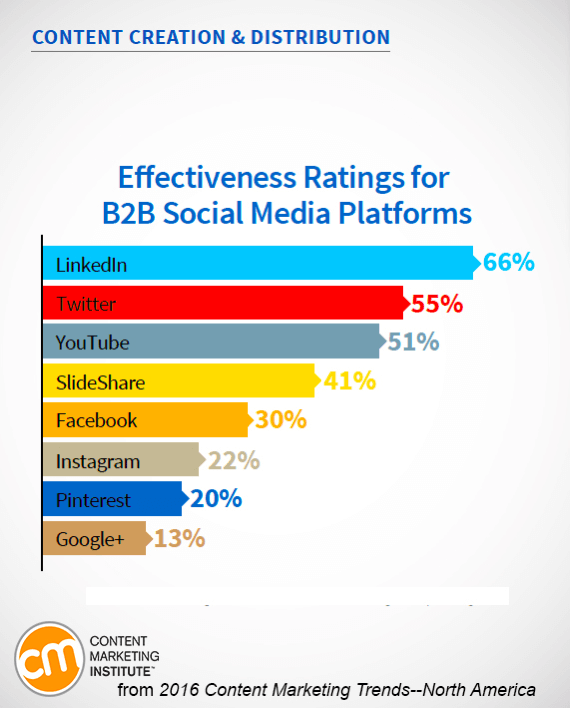 Breaking it down further, B2B marketers do have favorite social media platforms. Twice as many marketers find LinkedIn effective as those that find Facebook effective. A darling of the B2B world for years, LinkedIn has become the salesperson’s hunting ground. The platform has always enjoyed a more serious reputation than Facebook with its memes and fun apps that appeal to a diverse audience. Key Takeaway: When using social media channels, keep in mind that consumers go to Facebook and LinkedIn with different goals and mindsets. Facebook provides a fun and entertaining diversion from work. Marketers and companies that provide lighthearted content there generate goodwill with engagement following from that. B2B marketers, on the other hand, must recognize that LinkedIn users’ goals have more to do with career advancement. In turn, they should provide content that helps users build skills for their current job, find vendors to solve business problems, or get another job. In LinkedIn’s case, providing critical, career-building information creates the goodwill that could lead to a sale down the line. Advertising executives get to survey a variety of clients’ ROIs from an enviable height. Recent check-ins with industry experts add another dimension to the evolving picture of social advertising possibilities and limitations. While this study doesn’t analyze specific marketing tactics like promoted posts and social ads, it does provide a general idea of which platform drives ROI the best. 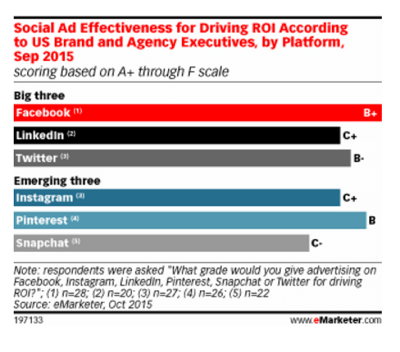 eMarketer’s report Social Advertising Effectiveness Scorecard: Industry Execs Grade the Leading Platforms surveyed executives at 29 companies. While the report didn’t look at B2B versus B2C, in general, executives graded Facebook higher than Pinterest, which earned the second-highest scoring of the contenders with a solid B. Advertising executives are most pleased with Facebook’s potential to drive ROI. Key Takeaway: Snapchat received a C– grade, but it only recently brought down its minimum advertising budget from the $700,000 mark. This means few companies have any experience on the platform. While Instagram scored only a C+, the Facebook-owned platform just recently opened advertising to the masses with APIs that make self-service advertising as easy as it is on Facebook. Snapchat is in talks with developers now about creating the APIs that will eventually allow businesses of all sizes to advertise on the platform without the interference of third-party developers and agencies. Advertising agencies, marketers and business owners are still sorting out which industries do best on which social platform. With best practices proven more anecdotally than quantitatively at this point, the burden rests on each business to measure all leads and sales resulting from social media to truly understand their own ROI. A few years ago, average everyday people from around the world began sharing their video-gaming, makeup, and fashion tips on YouTube or via their blogs. When they became sensations, a new type of brand advocate was born. Recent research suggests that sponsored posts are selling products. Creative online marketplace Izea, along with research firms Halverson Group and The Right Brain Consumer Consulting, surveyed 511 marketers with experience in sponsored social efforts. 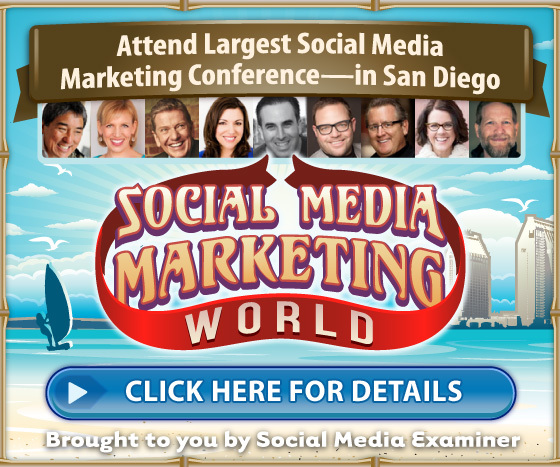 Sponsored social posts are one of the most effective traditional marketing approaches. Users admit to being influenced more by messages coming from their social heroes than almost any other person or platform. Grading on a curve, sponsored social posts are just 0.5 points behind the winner, content marketing, which scored 7.75 out of 10. More interesting, sponsored social posts are 1 full point ahead of celebrity endorsements. Of the companies that Izea and Halverson surveyed, 52% reported that they had a stand-alone budget just for sponsored social in their marketing mix. The social media users who graded how well they responded to messages from their favorite bloggers, podcasters, and YouTube sensations back up this finding. The chart below, created by eMarketer, visualizes data from the same study mentioned above. This time, the chart reflects the study authors’ survey of 1,003 social media users. Sponsored social posts on all of the channels beat out SEO (#15), PPC (#18), and print ads (#19). Only television ads and sponsored television programs could compete with sponsored social posts in effectiveness, according to consumers. Key Takeaway: While sponsored posts can be one of the more expensive social marketing tactics, a good return justifies any expenditure. If consumers admit that they’re most influenced by social media stars, companies must adjust their tactics accordingly. Again, however, the relative newness and lack of saturation for sponsored social posts also give them an edge. According to the Global Alliance of Data-Driven Marketing Associations, social media management and content enjoyed the biggest spending growth and performance change in 2015. While other marketing elements look poised for an influx of dollars in 2016, social media’s latest marketing tools and paid advertising opportunities clearly have marketers’ attention. What do you think? 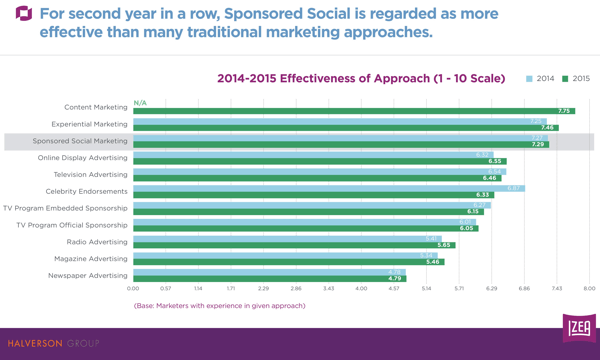 Does your company have a sponsor, social ads, or even a new platform in its future? Have you had robust results from any of these tactics? Let us know in the comments below!